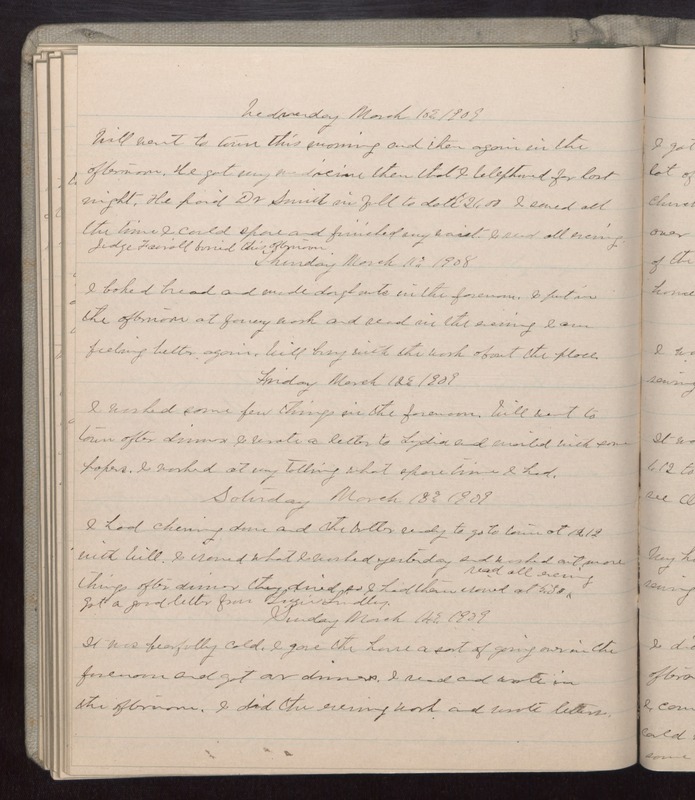 Wednesday March 10 1909 Will went to town this morning and then again in the afternoon. He got my medicine then that I telephoned for last night. He paid Dr Smith in full to date $21.00 I sewed all the time I could spare and finished my waist. I read all evening. Judge [Fairoll?] buried this afternoon. Thursday March 11 1909 I baked bread and made doughnuts in the forenoon. I put in the afternoon at fancy work and read in the evening. I am feeling better again. Wll busy with the work about the place. Friday March 12 1909 I washed some few things in the afternoon. Will went to town after dinner I wrote a letter to Lydia and mailed with some papers. I worked at my tatting what spare time I had. Saturday March 13 1909 I had churning done and the butter ready to go to town at 12.12 with Will. I ironed what I washed yesterday and washed out more things after dinner they dried so I had them ironed at 5.30 read all evening got a good letter from Lizzie Lindley. Sunday March 14 1909 It was frightfully cold. I gave the house a sort of going over in the forenoon and got our dinners. I read and wrote in the afternoon. I did the evening work and wrote letters.